I'm new to the world of chickens. I had talked about having chickens for years. Most of the time it was as a joke. However, i just recently moved into a more rural community, which in the past has been known for his farm lifestyle, so I thought it was the best time to start my own little chicken coop. My initial plan was to only have 3-4 chickens. However, when I started looking around, I continued to find "cool" looking chickens. My family consists of myself and my loving wife, so there is not a "huge" demand for eggs or chickens for that matter. My 3-4 chickens initially turned out to 11. Unfortunately early on in the process, I lost 2 of them. One lost its life in the water bowl I had. (Had is the keyword. It has now been sent to the underworld as well.) The second lost it's life in mysterious fashion. It was found outside the fenced run(he was an escape artist) but there were no injuries to the bird. I have a supervisor at work who has chickens and talks about them frequently. 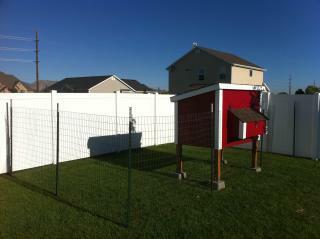 I took ideas from his coop, and many ideas from this website in order to construct my coop, run, feeder, and waterer. It has been an adventure to say the least, but I have enjoyed every moment of it. I have spent countless hours reading through the message boards finding answers to my numerous questions, and I truly feel I have made a happy environment for my chickens. If only my dog was as fond of them as I am. The floor of my coop has the ability to suit my particular need/style. I initially built it with the ability for the droppings to drop through the floor to the ground below using 1inch chicken wire. 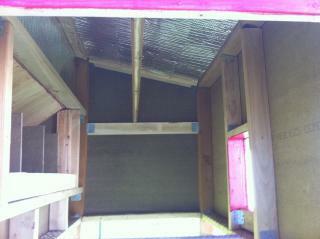 This allows the air movement in the coop. I also added runners on the bottom so that I can slide a piece of plywood under the coop and use the deep layer method during the winter to allow for the added warmth since we can have some colder winter months. 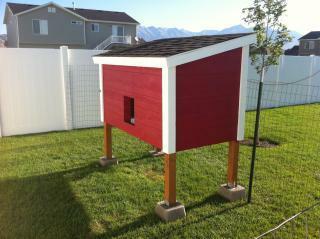 Below are some photographs of my coop and run immediately upon finishing construction. 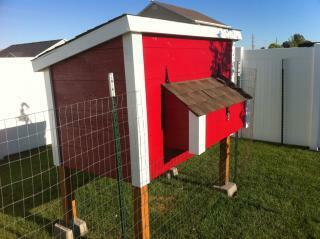 I have added the waterer, feeder, ladder, and a outdoor roost since this time. I hope to get updated photos in the next couple of days. 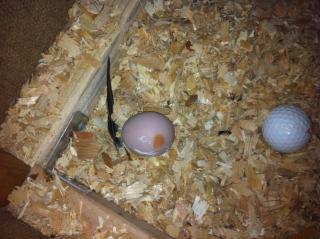 GOT OUR VERY FIRST EGG!!!! Excited to have the new addition. Now wondering if my oldest chicken who should have been laying for a long time might actually be a rooster.